Cool Runnings And The Crown Prince Of Reggae. The sudden death aged just 42 of Jamaican singer Dennis Brown on July 1, 1999 sent a shockwave through the world of reggae and robbed the music of its most popular ever grassroots performer. Feted as a child star in the 1960s and billed as the Boy Wonder, Dennis Brown went on to fulfil his earlier promise with a recording career that spanned 30 years and dominated the reggae dancehalls for the next three decades. During this time, the singer released more records and scored a greater number of hits than any other artist working in the reggae field. Deep Down With Dennis Brown - Cool Runnings And The Crown Prince Of Reggae traces the busy years of his early rise to prominence in the 1970s, when the singer developed his distinct style and also made the majority of his best and most famous recordings. Told as a short story in the author's highly personal style and set against the backdrop of the London underground reggae scene during these turbulent times, this profile of its star act provides a fascinating insider's insight into an otherwise hidden world. In this respect, here is a unique piece of written work, not only in the medium of reggae music, but as a wholly original approach to the debate of popular music and its wider cultural concerns. In addition to the text, full colour illustrations of photographs, album sleeves, record labels, concert posters and other ephemera from the era are reproduced throughout the book, adding a striking visual accompaniment to the story as it unfolds and the half that has never been told is revealed. Penny Reel is one of the UK's reggae foundation writers. was & still is a tremendous inspiration. The author: Penny Reel has written extensively about popular black music and specifically reggae since the early 1970s and in that time has met and interviewed most of the latter’s major players. During this period he has freelanced on a regular basis for publications including International Times, Oz, Time Out, Mojo, Virgin Yearbook, Sounds, Music Week, Wire, Straight No Chaser, Underground and many others. During the 1970s-80s, he was the chief correspondent on reggae for New Musical Express, at the height of the paper’s success as market leader in its field, and from the mid-70s until the end of the millennium wrote a regular column for the weekly tabloid Black Echoes as well as sundry articles, reviews, think pieces and other work. “Fan's Of Penny Reel's writings on London and reggae have a double treat here in this atmospheric story of Dennis Brown's,"unrivalled importance as a reggae artist" during the music's golden years - bookended in this account with two different Joe Gibbs recordings of the infamous Money In My Pocket: 1972 to 1979. Throughout the early part of this period reggae was underground: ill-reported outside its immediate community, served by dozens of transient shebeens, clubs and record labels. Reel's account is poetic, impassioned and respectful of arcana which would otherwise be lost to knowledge. Ending on the eve of Brown's first national chart hit, Deep Down With...leaves you wanting more." Deep Down is a book set in the clubs and dives of inner city London during the 1970s and charts the progress of the local underground reggae scene as it existed during these times. The book traces the years of the Jamaican singer's early rise to prominence and discusses in detail some of his most famous and noteworthy recordings. facts and figures is very successful." "Mr Reel has a way with words. His wonderful richly distilled Runyonesque prose marks him out as an authentic character and chronicler of the developments and paths of Jamaican music in London… Very entertaining and fact rich read." "A handsomely illustrated testament to the life of a singer who brought more than a little love into the hard lives of the Jamaican people and those whose roots lay in the Caribbean." one horse backers and scene stealers." "Indispensable to not only Dennis Brown aficionados but reggae lovers in general. Penny Reel's text is a revelation." this book informs as it entertains." 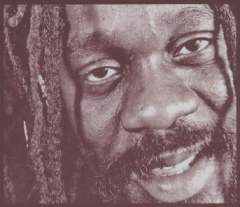 to know why Dennis Brown is one of the music's greatest stars." 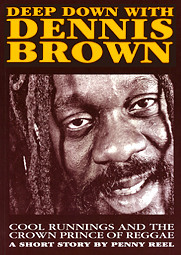 Presented as a portrait of Dennis Brown at the height of his powers and fame in the seventies this makes a refreshing change to some of the rather small-minded obituaries that appeared immediately after Dennis' untimely demise which tended to concentrate on the perceived downside of his career. "The purpose of this book... is to establish Dennis Brown's unrivalled importance as a reggae artist before his contribution can be overlooked or forgotten". Presentation - beautifully illustrated with many period pictures, record labels and memoribilia - is excellent and we are unable to fault the reasoning. One of the best books ever written about reggae - an affectionate tribute to "The Crown Prince" - singer Dennis Brown. More than a biography, this is a real labour of love with vast amounts of colour illustrations and photos. It is also crucial reading for anyone interested in the reggae scene in London in the late 20th century. A beautiful tribute to such a huge talent.